A couple of weeks ago I came home to a fabulous treat on my porch. The wonderful people at Food Should Taste Good had sent me a box of goodies to try out. I mean, who doesn't love to come home to a tasty surprise like that? In the box, I found boxes of their new Brown Rice Crackers. 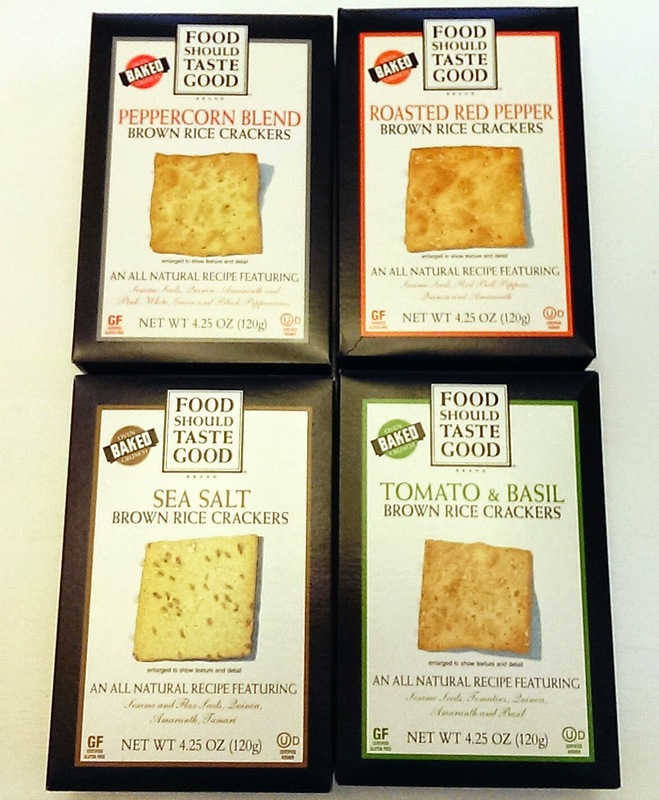 Flavors included are: Peppercorn Blend, Roasted Red Bell Pepper, Sea Salt and Tomato & Basil. I am admittedly a chip addict. I guess I tend to crave that satisfying crunch you get from a chip. Now, we all know chips aren't typically a healthy snack. So when you can find a brand like Food Should Taste Good that makes a more wholesome chip, you get pretty excited. But now they're upping the ante a bit with their new gluten-free crackers. They are similar to their line of chips in that they're full of flavor, and fun flavor combos, and they're nice and crispy. While the chips make for awesome dipping, these crackers are great vessels for topping. Think wheat thin style crackers, only healthier and more flavorful. Whole Grain Brown Rice Flour, Brown Sugar, Rice Flour, High Oleic Canola Oil, Sesame Seed, Dried Red Bell Peppers, Corn Starch, Quinoa Seeds, Amaranth Seeds, Onion Powder, Dried Garlic, Sea Salt, Rosemary Extract. As you can see, not too shabby of a list. I mean, you can pronounce all of the ingredients and can also recognize the ingredients. They are also significantly lower in sodium and fat than comparable thin crackers. So, if you're like me and crave crunchy treats from time-to-time, I think you'll love these. Do you crave crunchy snacks? What are your favorite chips or crackers?